This could be you if you win the Fantasy Tour de France in the DTTalk ProCycling League. Joined the Strava group so you can enter the DTTalk Ultimate Cycling Challenge as well. I’ll repeat some information about the DTTalk Ultimate Cycling Challenge as some readers might have missed the last update. I’ve invented CCA – Combined Cycling Arts. This is a revolutionary, world-first concept, exclusive to DTTalk ProCycling League. Riders in our league can go beyond the normal fantasy cycling competition. You have the option to also enter the DTTalk Ultimate Cycling Challenge (DTTUCC). 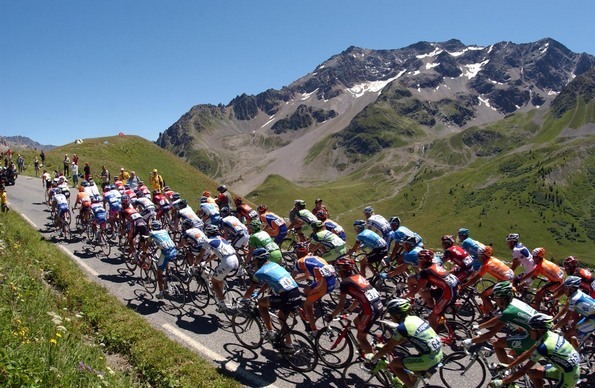 The DTTalk Ultimate Cycling Challenge will run for the duration of the Tour de France. In recognition of the fact that pro-cycling requires both strategy and physical endurance, the challenge will combine your fantasy points with the number of kilometres you ride on your bike during that period. That’s right: fantasy points + personal kilometres ridden = mind.blown. You take your mobile on your ride; turn the strava app on when you start your ride. The app will automatically record your ride speed, distance and elevation, and map your route as well. This happens via GPS; it doesn’t require a continuous live phone or internet connection. When you finish your ride you upload the details to the strava database when you next connect to the internet. Your rides and km distances will then be listed with the rest of the rides in the group – you can look at them all on your computer. You will also see how much your rivals are riding. I will add the fantasy points and kilometres ridden together, and publish the results. So far uptake has been disappointing. Which is great because I will win and become the inaugural world ultimate cycling challenge champion. And I will talk and write about My Title a lot. For the whole of the next year. So if you want to stop me you haven’t got much time left to enter. However, this isn’t compulsory and you can just play normal fantasy in our league if you wish. Let’s try and simplify things a bit with some basic advice. You have 160 credits for 9 riders. You should aim to start with 5 gun riders who average about 28 credits each and 4 super cheap riders who average about 4 credits each. You aim to have your 5 gun riders winning lots of points every stage. So you use your 2 trades a day to swap out riders who are not going to get points on next stage, and bring in riders who will. You select your cheap riders with the aim of them getting some points also – i.e. getting into a breakaway and getting intermediate points, or them having a team mate that win the stages. Now we will look at the stage analysis. Plenty of other sites will give you brief stage descriptions and profiles of the stages. But what we really want to see is this table. It looks a bit complicated so let’s break it down. The left most column give the stage number – all 21 stages. It also shows rest days. This is relevant because we get 2 free trades on rest days as well. So we will have 4 trades for the stages following rest days. The left half of the table shows the actual scoring in the Tour de France jersey competions (i.e. the real race not the fantasy comp). Column 2 – the KOM column – is for the King of the Mountains competition (white jersey with red dots). 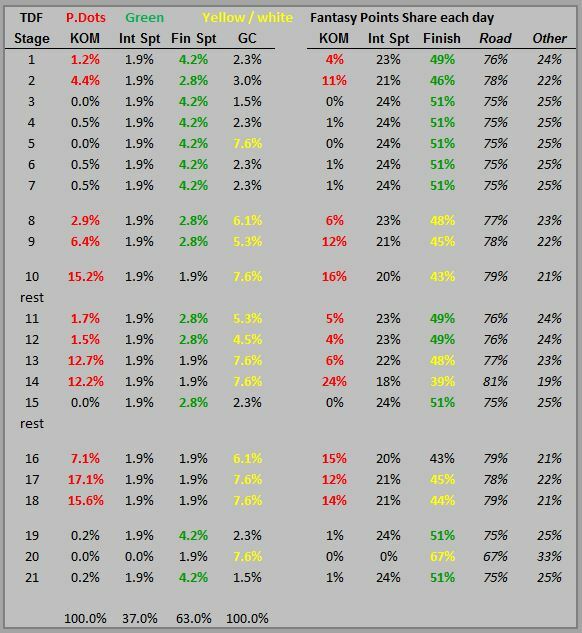 The stages with red percentages are the 12 stages that have the most KOM points available, so we can expect riders trying to win the KOM to try and break away for those stages. Columns 3 & 4 are for the sprint points competition (green jersey). All stages have 1 intermediate sprint worth the same points, except for stage 20, the time trial. The stages with the green percentages in column 4 are the 12 stages that have the most sprint points available. These are also the flattest stages, so we can expect sprinters to concentrate on these stages. 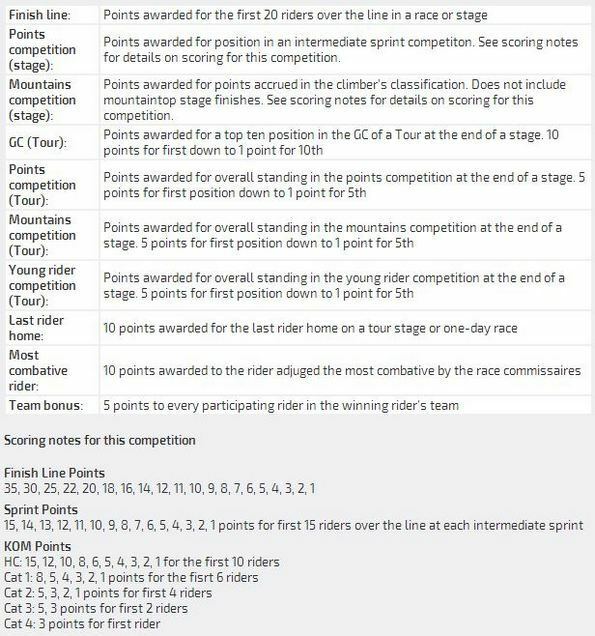 Column 5 measures the relative importance of each stage for the Overall or General Classification (GC) competition (yellow jersey). The stages with the yellow percentages in column 5 offer the most opportunity for GC riders to gain or lose time relative to other GC riders. The measures in Column 5 are also relevant for the white jersey competition for the best young rider. This table tells you what type of riders you want in your team at various stages. There is a very strong message already. You don’t need any GC riders till around stage 8 (stage 5 might effect the GC comp, but this will be GC riders losing time on a cobbled stage, not winning you fantasy points so ignore that). 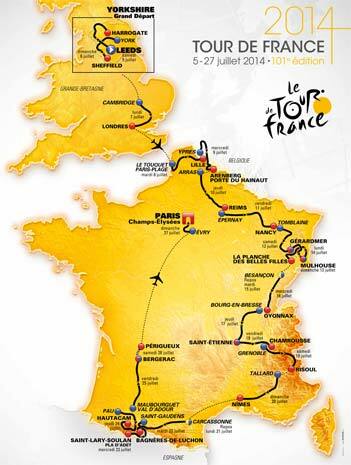 Also ignore any media talking about Froome, Contador and Nibali and who is going to win the TDF. Instead we need to concentrate on who is going to win us fantasy points in the first 7 stages. The right half of the table shows how the fantasy points are split up in each stage (i.e the points your fantasy riders will be chasing). The right side of the table adds up to 100% along the rows not down the columns like the left side of the table. The first point is that the colour coding matches up well with the left hand side. This means the fantasy scoring is consistent with what the actual teams and riders are trying to do. This is one of the reasons I prefer this game over other fantasy options. If fantasy cycling is about being a virtual Directeur Sportif (team manager) then this game comes closest to that. 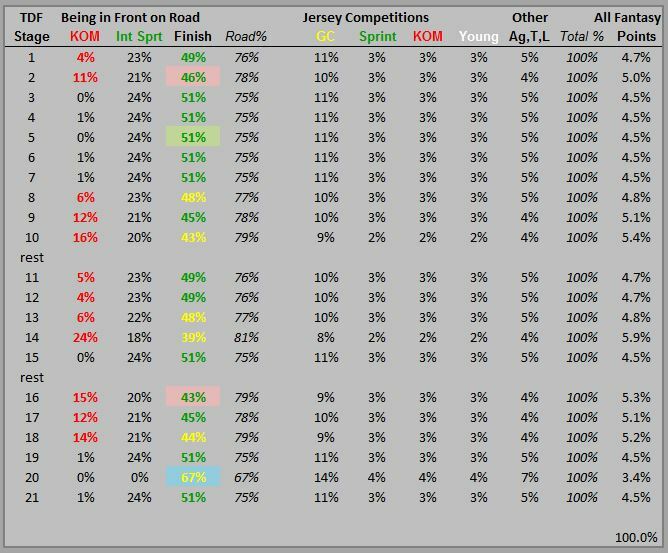 Most of the point spread for each stage comes from which riders are leading the race at various points on the road in that stage (75-81%). So this is more important than other things such as being the current leader in various jersey competitions. Ideally we want riders who do well on the road in each stage AND also have good position in the jersey competitions. If you can’t choose between a few riders with similar on-road performance, pick the one with the best position in the jersey comps for added points. The Finish column colour coding shows the types of riders who will be contesting the finish in each stage. Green indicates sprinters (although stage 2 will be sprinters who can climb modest hills, and stage 5 will be sprinters who can ride cobble stones well). Yellow indicates GC riders and climbers (except stage 20 which will be GC riders and time triallers). We have covered some basic concepts, now we will look at just the fantasy analysis for each stage. The table below details how fantasy cycling is scored (this is repeated from in the last article). This is what it means on a stage by stage basis. The right hand column shows that most of the stages carry about 5% of the total fantasy race points although there is a little variation. Stages with pink background are medium mountain stages. The stage with green background has cobbled sectors and the stage with blue background is an individual time trial. Stage 1: The sprinters who finish in lead in first stage will get extra points as they will also lead the initial jersey comps. Start your team with the big name gun sprinters. Stage 2 is a medium climb stage with a sprint finish – trade in allrounders/puncheurs. Jerseys will probably change hands here and then be retained until stage 5. Stage 3 & 4: Use your trades to build up sprint strength of your team. Stage 5 has a lot of cobbled sectors. There will be crashes and the peleton will be split up. Trade in riders who have performed well on cobbled stages and one-day classics in the past as they will lead the race on the road. Jersey rankings will change on this stage and then be retained until stage 8. Stage 6 & 7 – Use your trades to build up sprint strength, but also start planning how you will add climbers and GC riders to your team for stage 8. That will do for now. You get the idea. We will continue this next week as we prepare our teams for the first mountain stages in the French Alps. Firstly, this linked article has a good discussion of the various teams, all the riders, and what their focus will be. It also includes images of all the team jerseys which you need to know in order to follow your riders on the TV coverage. Pick 5 gun sprinters with 4 very cheap riders, or pick 6 lower quality sprinters with 3 very cheap riders? and, To Sagan or not to Sagan? Peter Sagan is the most expensive rider at 40 credits. If we pick him we have less money to spend on other riders. The three best sprinters are Kittel (30.6), Cavandish (35.7) and Greipel (33.2) and probably in that order. Kittel and Cavandish have the best leadout teams, but Greipel‘s team is also OK.
Kittel is fastest but he isn’t as good as others in going uphill or navigating tight bends. He is cheaper because he doesn’t get to as many finishes with the lead group as the other riders. Cavandish is the best climber and being from UK has set himself for a stage 1 win here all year. 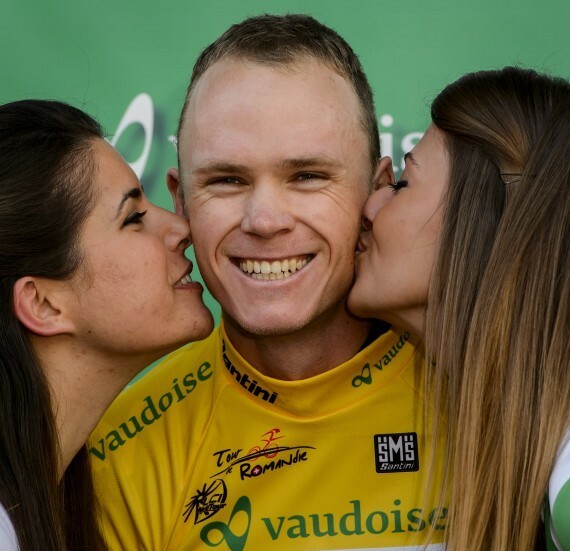 His mother was born in the town where the finish is, and if he wins he will also wear the yellow jersey for the first time, and in his home country. He wants it most. Greipel is older and coming back from injury. I expect he will be a little slower than the others. The next fastest group of sprinters are probably Sagan (40.0), Demare (24.6), Viviani (23.5), Modolo (16.0) and Kristoff (29.1) not necessarily in that order. Degenkolb (29.0) would be in this group except he is in the same team as Kittel and so I expect he will support Kittel in stage 1. Sagan and Viviani are on the same team also, but they tend not to work together. After this group are other sprinters like Simon, Petit, Coquard, Reza, Feillu, Fonseca, Demspter, Voss, S.Dumoulin, Van Avermaet, Van Poppel, and Bennati. I expect all of these riders would like to win the stage, and the intermediate sprint points and also get leaders jerseys at the end of the day. Out challenge is to try and pick 5 or 6 of the best ones within the salary cap. Stage 2 is much more hilly with lots of rolling climbs including some quite steep sections – see the video at the end of this article. So we should trade out the worst climbers of our sprinters, and we should trade in all rounders – riders like Sagan (40.0), Kwiatkowski (30.8), Valverde (34.5), Gerrans (23.6), Slagter (17.4), Vanmarcke (16.6). However, we only have 2 trades, unless we want to buy extra trades at 10 points per trade – we can’t replace all the stage 1 sprinters. Plus then we will trade the all rounders out again for stage 3, and get the sprinters back for the race into London (stage 3). So for me the big advantage in starting with Sagan as one of my sprinters is that I don’t have to use trades to get him in for stage 2. Sagan is worth having in the early stages as he should pick up a lot of points – from stage finishes, intermediate points and jersey rankings. Sagan’s contract is up for renewal this year and he is likely to change teams. He will want to do well in TDF to increase the value of his new contract. If you have any questions or comments post below or hit me up on @NixTrader. Follow me to keep up with the latest fantasy cycling info. I will tweet when updates are added to the article. If you are having trouble finding any of the previous cycling articles on DTTalk you should bookmark this link – All DTTalk Cycling articles. Very useful to get excellent info on the type of terrain for the first 2 stages and how the race will develop as each stage progresses. Particularly to understand why stage 2 will be so difficult. Thanks .. how is your team selection going? Struggling with team selection at the moment. Think your slightly underselling the difficulty of stage 2. With narrow roads and lots of climbs the GC contenders wiIl all want to be close to the front resulting in a fast pace and a very hard days racing. Wouldnt surprise me if a very small group is left to contest the finish. I agree stage 2 will be a beast and didn’t intend to suggest otherwise (see video at end). Yes, I also think a small bunch will contest finish. I think all the GC guys will mark each other and finish together, with majority of riders dropped. But probably a smaller group of puncheurs will try to come off the front to contest the finish in last 5 kms. However, if any of the GC guys attacks the others will go with him. I don’t think the Sky-train will be out in full force to try and break rivals here. So I doubt there will be any time gaps for main GC contenders. But I expect yellow jersey will change from Cav/Kittel to Sagan/Kwia/Gerro. Although if Cav wins stage 1 he might want to keep yellow all the way to London in front of the adoring crowds! He can climb OK if he needs to, but usually he saves his energy for flat stages. He might forego part chance of win in London for 3 days in yellow in his home country by just finishing with leaders. My team so far: Cavendish, Greipel, Kittel, Degenkolb, Goss, Pichot, Bernaudeau, Kessiakoff and Fumeaux. Last four are just cheapies so I could fit the gun sprinters. Goss didn’t make the final OGE squad so he isn’t riding. He isn’t in the current road.cc list of riders, so they have removed him. When did you make this team? I think there have been a few changes in the final teams since then. Are any of your riders greyed out? If they are it means they are not riding in the TDF. But I think you are on right track with 5 guns + 4 cheaps strategy. No question OGE are targeting that stage. However, there is a question about whether OGE will work for Gerro or Matthews in stage 2. OGE will also try and get Clarke, Yates or Albasini into break and then leave it to other teams to chase. Bigger problem for Matthews is he had a training stack and has stiches in his hand. I’ve seen pic from yesterday where it looks like he has ‘plaster’ up to his elbow. He might not start TDF at all. OGE have flown in Meier as standby. Matthews is confirmed out now. Welcome. I’ve just accepted another batch of entries so you should be in the league now. Some hints and comments on SBS Game for those playing that. – If you need more money change your nominated ‘Team’ to a cheaper team. The team isn’t going to bring you many points compared to having the best riders. – Pricing is a bit easier in the SBS game. There are plenty of reasonable sprinter options at the cheapest price (see the names I list in the article). Load up for stage 1. – Expect to use most of your 8 trades in the first week to adjust for stages 2 and 5. Expect to use trades prior to and immediately after stages 2 and 5. Otherwise maintain a core sprinting team. Has anyone found where SBS list which stages are cat 1 & cat 2? Seems an essential bit of info that is missing or has a broken link. Well Stage 1 didn’t go to my plan. Happy at least I bit the bullet and took Sagan. Road.cc game – 117 pts which ranks me 580 out of 5,060. SBS game – 203 pts which ranks me 2,045 out of 12,530. Although stage 1 was most popular bonus stage choice, so lots of people got double points on that first stage which distorts the standings a bit. This makes it a bad game concept IMO. Anyway how did everyone else go? Important stage tonight, difficult to pick but lots of KOM points on offer and jerseys will change hands. You should be trading for this stage. Join the discussion in this thread. Come back later today, I will post a bit of a mini-preview of riders who may figure in stage 2. Meanwhile I have to get on my bike to get up some strava Kms for ultimate cycling challenge. Gerrans and Kwiatowski (although perhaps not after crashes in S1). Sagan, Valverde, Costa, Valverde, Chavenal, Cancellara, Van Avermaet, Gallopin, Albasini and Vichot. Crash was a bit of a disaster but could be worse I guess. Tonights stage is so hard to pick could make 2 trades and end up netting zero. Finding I can’t really move my team much in RCC due to the prices. Was going to get Gerrans but the crash might make it difficult for him to get up near the front tonight. Seems to be a lot of value in the SBS comp. Cavendish is out of race so trade him if you have him in both games. I stayed away from Gerrans – I think he won’t be at his best today. Day got away from me, so no chance for write up. Better previews are available online anyway. But it is very hard to pick. I half think Nibali might attack which will bring all the GC guys and their teams in to play. Anything could happen – will be good to watch tonight. Nice tipping Nix, think you picked the first 6 from 12 selections. Road.cc game – 78 pts which moves my rank up to 353 out of 5,253. SBS game – 137 pts which moves my rank up to 1,239 out of 12,844. Thanks, yes my tips went OK. Unfortunately I traded in Valverde (17th) and not some of the others. I’m glad Nibali had a crack this stage. It suited him as he has more flat speed than the other GC contenders. I was still surprised they let him go though. Modolo was a DNF so he has to be traded out if you have him (like me). Next stage is a flat sprint stage into London. Easier than stage 1. So comments on sprinters in above article apply to this stage. 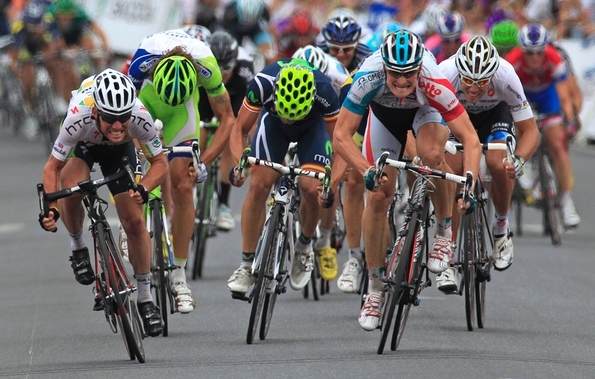 Without Cavendish in race, it is Kittel’s to lose. Trade back in your big gun sprinters. Hopefully the hard ride in this stage didn’t take too much out of them. The current leader of our league is sitting 2nd overall. Nice work Stevos. Some good scoring this round in DTTalk league. I will be posting an new update article today, with a preview for crucial stage 5.